Robert and I decided to go on our first official date since coming to Nebraska. 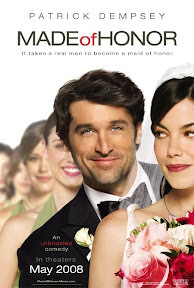 I have been wanting to watch McDreamy's movie "Made of Honor" and saw that it was showing in Marcus theaters in 20 Grand and Village Pointe. First we went on a late lunch with Mama in the mall in Offutt Air Force Base. It was a new mall and it was the grand opening day. We had some good ol' Popeyes fried chicken with biscuits. Then we went to Grand 20 to catch the 7:40pm show time. I completely forgot how small movie theaters are here. I personally like smaller theaters. The movie was cute and had some really laugh-out-loud funny moments. I am sure it got slammed by the critics but I loved it! And I am glad I have a husband who appreciates romantic comedies and laughs along with me. I'm so happy you're back to blogging, Sam.